A woman waits for her husband to return home. That pretty much sums up Emmanuel Finkiel’s internally-focused Memoir of War, though it’s probably a little more helpful to describe it this way: a French Writer living in occupied Paris waits for her husband’s release from Hitler’s Gestapo as WWII grinds down to an end. There is precious little in way of plot, yet Finkiel manages to refashion this semi-autobiographical story (based on Marguerite Duras’ actual memoir) into a psychological character study infused with his own take on the intersection between grief and memory. To be sure, this is a heavy film- a really heavy film- but it also plays with truth and fiction. Our protagonist, Marguerite (Mélanie Thierry, The Zero Theorem), says as much in the opening line, admitting that she herself can’t recall most of the events she had committed to paper in her journal. She spends the entire film harrowed and drained, going through the daily motions of searching for any information about her husband through whatever official channels she can navigate. This mostly takes the form of flirting with a Gestapo officer who clearly has an interest in her, both romantically and because he’s trying to pump her for information- but the entire film is really more about her state of mind than anything resembling a political thriller. The real Marguerite Duras wrote the screenplay to Hiroshima mon amour, and the spirit of that film haunts Memoir of War like a ghost that refuses to let go. Finkiel constantly plays with the idea of subjectivity vs. objectivity by showing Marguerite watching herself from the other side of the room, emphasizing how disconnected she feels from the woman everyone else sees. He also enjoys letting scenes wander from “reality” to “fantasy” for a few moments before you realize we are now in Marguerite’s imagination. If this sounds confusing on paper, it isn’t on film- a credit to Finkiel’s sure-handed direction. He strikes a balance between tightly controlled shots and letting the camera capture what it happens to capture; the film’s somber tone threatens to feel relentlessly oppressive, but we never get there. Instead, it’s an artful portrait of what a traumatic event such as war can do to a person. 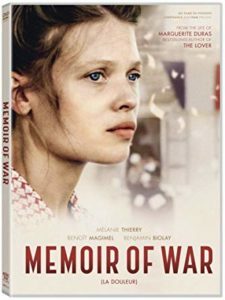 Usually, war films tend to focus on the innocent men sent to fight and suffer, but Memoir of War gives us the other side- the wives who are left just as ravaged and hollow even if they’ve never stepped onto a battlefield. Finkiel’s directing never falters in this approach. Despite being a major presence in Marguerite’s life, her husband Robert is never clearly seen. We see him from behind, in the shadows, at a distance, or, as is the case with the final, powerful shot of the film, as a distorted, faraway blur. The point is clear: this film isn’t about him. None of this feels contrived of forced- it’s all organic, natural, and yet clear in its narrative intent. Nominated for eight major César Awards this week, the Music Box DVD release of the film includes an insightful conversation with the director and other key technicians about the techniques they employed to achieve his unique vision, several deleted scenes, costume and screen tests, and an interview with Mélanie Thierry on her approach to playing the role of a grieving wife who also happens to be a famous French writer in real life.